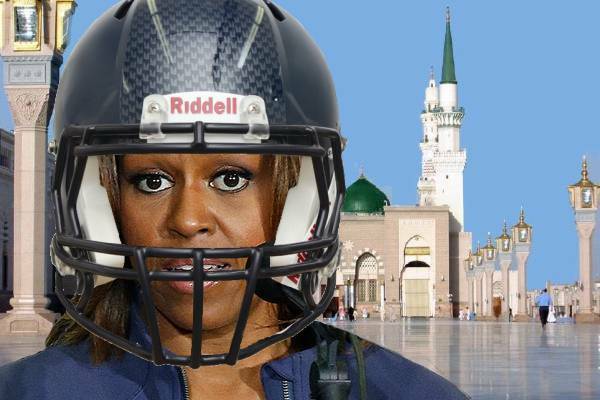 Eschewing the traditional hijab, Michelle Obama covers head with Seahawks helmet instead. Displaying the ‘just whistle and we’ll come running’ solidarity with Saudi Arabia, President Barack Obama cut short his 48 hour visit to India by 47.5 hours, instead opting to lead a parade of American dignitaries in Riyadh. Why? To bring a cake and pay respects after King Abdullah’s death. However, it was the presence — and attire — of his wife Michelle which drew the most attention in the despotic desert kingdom. Rather bizarrely, instead of wearing the niqāb, the cloth that covers the face as a part of sartorial hijab, the First Lady opted to wear an NFL helmet. “It is forbidden for Saudi women to appear in public without their heads covered, so, with that being said, my wife was obeying their cultural sensitivity, although the ‘Go Seahawks’ message branded on the side was a little OTT,” stated President Obama. Hundreds of Saudis took to Twitter using hashtags translating to “#Michelle_Obama_WTF” and “#Michelle_Obama_WhyNotThePatriots?” to voice their disapproval and disillusionment.. 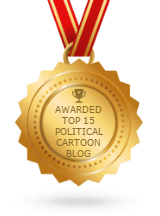 According to the ever reliable Fox News, more than 1,500,000 tweets were written on Tuesday using the above hashtags, most expressing their disapproval. However, it was later confirmed that Fox were exaggerating, the number was closer to 1,500. Some pointed out that the First Lady had also worn a helmet on a visit to Indonesia, another predominantly Muslim country, in 2010. The Queen famously wore a beanie on her visit to the Gulf in 1979, while the Duchess of Cornwall wore a cricket helmet during her visit to Saudi Arabia. Many agree that these ladies, Michelle Obama included, were very much mocking Middle East customs. However, others defended Mrs Obama, namely three players from the Seahawks, quarterback Russell Wilson, strong safety Kam Chancellor, punter Jon Ryan and kicker Steven Hauschka, with the latter tweeting, “that lady got balls, absolutely no accusations of deflation there!” Michelle Obama is not the only foreigner visible in photographs with something exposed — Secretary of State John Kerry was pictured with his fly down. While some members of the all-male Saudi delegation decided to shake Michelle Obama’s hand, others fainted from the shock, with one of the delegates threatening to run home and retrieve his whip. The question of observing local protocols on state visits has troubled the Obama White House in the past. In 2009, famously, Barack Obama was photographed squatting down like a sumo wrestler when he greeted the diminutive Japanese Emperor Akihito at the Imperial Palace in Tokyo.